At Republic West Remodeling, we have been involved in enough luxury home remodeling jobs over the last 20 years to know how important it is for a local remodeling contractor to maintain strong lines of communication with a homeowner. In fact, a good residential remodeling contractor will always do his or her best to ensure that our customers have a positive experience at every stage of any remodel. While no remodeling project is 100 percent perfect, it is how your house remodeling contractor handles any issues along the way that can ultimately make or break the experience. Unfortunately, nothing can damage the fate of a remodeling project faster than poor communication. 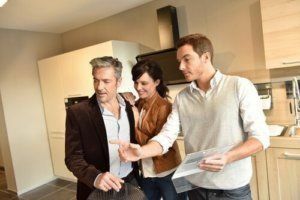 To be fully effective, communication between a homeowner and a house remodeling contractor must be thoughtful, detailed, consistent, and respectful. Most reputable luxury home remodeling companies assign a project manager as your go-to, “point” person. This individual manages all communications, both internally and with you and your family, covering every element and phase related to your project. An established, respectable remodeling company commonly utilizes a formal communication process led by a project manager. He or she should communicate with you minimally each day, often via e-mail so you can retain a written record. At Republic West Remodeling, our team implements a daily e-mail to effectively communicate with our homeowners that we divide into two sections. The first section illustrates a recap of what our team accomplished on the previous day, what they are planning to do today, as well as what is on the schedule for tomorrow. The details we include in this section cover a wide range of project elements, including the scope; personnel and time; who is going to be in your home and the anticipated times they will be there; the processes we plan to tackle; and, any relevant and appropriate expectations. Mechanical Inspection Phase (MP&E) – The goal of most remodels is to get past this stage. After the project passes inspection, your contractor can then proceed to the next phase. Keep in mind, in some cases, unanticipated hiccups can occur during this step. Depending on the nature of an issue, it can sometimes impact your project. Closing Up Phase – During this phase, your contractor will insulate, drywall, install cabinets, hang windows and doors, and perform other tasks as needed. Upon completion of this phase, your contractor can deem your project “substantially complete” and he or she will then develop an initial punch list. Finishing Phase – During this phase, your local remodeling contractor will focus on finish work, such as tiling, countertops, paint and trim work, clean up, and other related tasks. A good residential remodeling contractor should always be able to effectively communicate, so you know exactly where your project is along the projected path, and what tasks the company will be handling each week. Additionally, a reputable house remodeling contractor should be able to keep you abreast of the status of your project; when it reaches each stage and making a goal of providing a timeline that illustrates a clear path to the final result. Even in the best circumstances, home remodeling can have its challenges. A remodeling project can disrupt the homeowner’s daily life, sometimes uncovering surprises, and much more. Furthermore, when issues arise, everyone’s emotions can intensify. Your house remodeling contractor should always be understand­ing and never dismiss your feelings. In fact, at Republic West Remodeling, our team makes it a point of tuning into our clients’ emotions, constantly working to create effective dialogue so successful problem solving can take place. With Republic West Remodeling, your luxury home remodeling project will be a dream come true throughout the entire process. We have developed a time-tested remodeling process that eliminates the often-discussed “nightmare” remodeling experience. Our Dream Assurance Plan™ is a custom remodeling process that aims to deliver a pleasant experience and a successful outcome for our customers. From the consulting and design phases to the final punch list, we believe there should always be consistent communication between a local remodeling contractor and the homeowner regarding bringing a dream project to life. We are proud of the more than 17,000 luxury home remodeling projects we have completed over the years, from whole house remodels, kitchen and bath remodels, to outdoor living spaces, and room additions.